Vitamix Super - Got Greens? The Vitamix 5200 Super – Healthy Lifestyle Package comes with both wet and dry grains containers to make all your favorite dishes and grind grains. 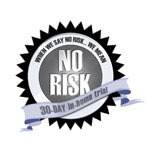 Save at least $25 ($35CN) with Free Standard Shipping using our Vitamix promo code. 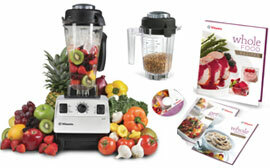 This Vitamix 5200 Super Healthy Lifestyle offer includes two new BPA Free containers, (64 oz. wet blade and 32 oz. dry blade Eastman Tritan copolyester containers). The dry grains container and blade are specifically designed for efficient dry blending of grains. It is also super at kneading dough. If you plan on grinding your own grain and/or making bread then the Super Package is a must have. The dry-grains container included with the Healthy Lifesyle package is also great for chopping tasks. The blade design in combination with the variable speed pulse ability makes this the best blender for making salsa and other food processing tasks. 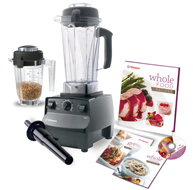 Prefer the » Vitamix Deluxe 5200 Complete Kitchen Package?